Three VMP Best Sellers... Soon to be Audiobooks! Exciting news! Three of our books will soon be available as audiobooks! 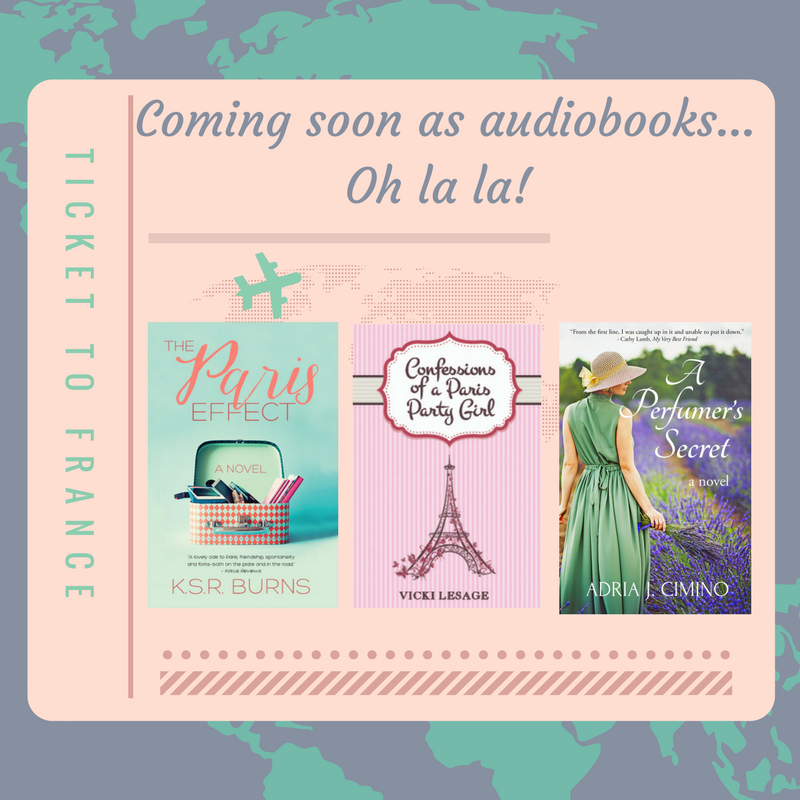 Velvet Morning Press has signed a deal with Tantor Media, a leading independent audiobook publisher, for the production of The Paris Effect by K.S.R. Burns, Confessions of a Paris Party Girl by Vicki Lesage and A Perfumer's Secret by Adria J. Cimino. Tantor's catalog includes Man Booker, Pulitzer, and National Book Award winners as well as numerous bestsellers. We are delighted to be working with such an accomplished player in the industry. Friendship, loss and a tantalizing trip to Paris in this highly praised #1 Amazon Best Seller in Women's Fiction that Kirkus Reviews calls a "can't-put-down-book" and an "absorbing adventure." When Amy loses her best friend, Kat, to cancer, she knows their dream of a secret trip to Paris will never come true. Yet Kat’s words haunt her, urging her to embark on the Paris trip alone and shed the dissatisfaction of her life in Phoenix. Little by little, Amy, grappling with a failing marriage and struggling with painful childhood memories, lets herself be swayed. 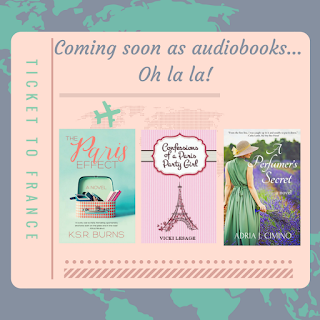 Guided by Kat’s bold voice, Amy sneaks off to Paris while her husband is away on a business trip. Once there, however, she finds that her problems have come right along with her. Through her adventures, laced with luscious descriptions of food and Paris, Amy learns that often in life, love and friendship, nothing is exactly as it seems. Will Amy choose the life she’s discovered in Paris or decide to revive the one she left behind? When newly-single party girl Vicki moves to Paris, she hopes to indulge in wine, stuff her face with croissants, and fall in love. It proves to be much more difficile than she imagined. In this laugh-out-loud memoir, this cheeky storyteller recounts the highs and lows of her life in the City of Light. Sassy and shamelessly honest, Vicki makes you feel as if you're right there in Paris stumbling along the cobblestones with her. Will she find love? Will she learn to consume reasonable amounts of alcohol? Will French bureaucracy ever cut her a break? Perfumer Zoe Flore travels to Grasse, perfume capital of the world, to collect a formula: her inheritance from the family she never knew existed. The scent matches the one worn by her mother, who passed away when Zoe was a teenager. Zoe, competing to create a new fragrance for prestigious designer Cherone, believes this scent could win the contract—and lead her to the reason her mother fled Grasse for New York City. Before Zoe can discover the truth, the formula is stolen. Philippe Chevrefeuille, the enigmatic competitor who makes her heart race, is the only one who can help her find it. But Zoe is in no mood for romance, or at least that's what she tries telling herself. Philippe knows that winning the Cherone fragrance contract is the way out of his mid-level perfumery job. And he has the ambition and ego to make it happen. Until Zoe enters the picture. In an instant, he's under her spell and losing his grip on his own creativity. If Philippe hopes to win, he must keep Zoe from finding the missing formula. But can he betray his own heart? The pursuit transforms into a journey of self-discovery as each struggles to understand the complexities of love, the force of pride and the meaning of family. The Paris Effect, Confessions of a Paris Party Girl and A Perfumer's Secret are currently available in ebook and paperback on online retailers.